Munising Michigan is located at the gateway to the western part of the Pictured Rocks National Park, is a four season tourist destination area. Lots of lodging, restaurants, and services. 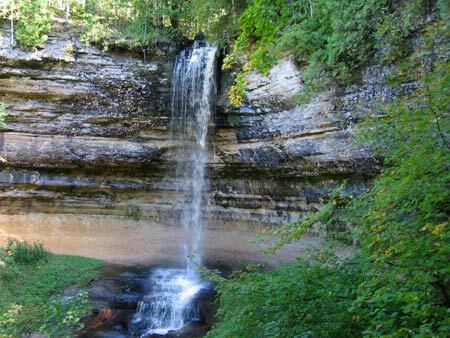 There are 5 waterfalls around Munising and another 4 within 20 miles. 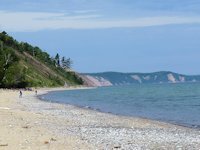 If you have more time to spend in the Munising area, you might want to take the ferry to Grand Island National Recreation Area. Hiking, mountain biking, and beach combing are favorite island past-times. If you have time, a must-see attraction is taking a Pictured Rocks Cruise (go here for more info). The Pictured Rocks National Lakeshore Park is the biggest area attraction. It stretches along Lake Superior over 40 miles between Munising, MI (western side) and Grand Marais, MI (eastern side). While in Munising, we like staying at the Bay Furnance National Forest campground (actually in the little town of Christmas), a very nicely laid out campground on Lake Superior, with semi-modern facilities suitable for tent camping or RVs. We've also stayed at the Munising Tourist Park, also on the lake. Unlike Bay Furnace the town park has full RV facilities with showers, electrical hookups, and dump station. Also a nice wireless Internet hookup. Actually located within the Munising city limits, Munising Falls is in a pretty little park with a paved quarter mile trail throught the woods to the falls. The falls cascades down over 50 feet. 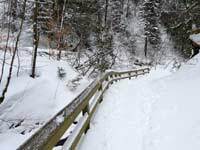 Also plan to visit the Munising Falls Visitor Center, featuring "displays on the rich natural and cultural history of Pictured Rocks National Lakeshore. Exhibits on early iron smelting, geology, forest history, rare and endangered species, logging, and recreation portray the diversity of our nation's first national lakeshore. Wagner Falls is a mile or two south of town near the intersection of Michigan 28 and Michigan 94 highways. Althought the drop isn't as high as Munising Falls it is an impressive display. 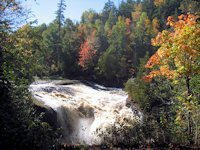 Other nearby falls worth visiting are Tannery Falls, MNA Memorial Falls, and Alger Falls. More falls can be found in Pictured Rocks Lakeshore National Park and between Munising and Marquette. One of the popular places to eat in Munising is the Dogpatch Restaurant. Inside it is decorated with large reproductions of Li'l Abner, Daisy Mae, Mammy Yokum and other characters from Al Capp's famous comic strip. Naturally many of the menu items are named after the characters and some of the favorite "fixins" from the legendary village of Dogpatch. Friendly wait service, good food, and a fun atmosphere. In our estimation, the nicest Munising area public campground is on Lake Superior just west of Munising in the town of Christmas. 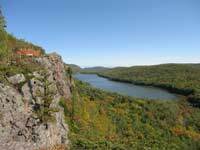 Bay Furnace Recreation Area is a national forest campground with 50 sites. There's another National Forest Service campground at Au Train Lake, about 15 miles west of Munising. Waterfall explorers will also enjoy finding Au Train Falls, a series of steps and cascades that drops 50 feet over a 200 foot stretch of river. 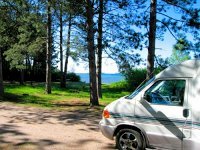 The Munising Tourist Park Campground is another option to consider, especially for RV'ers who want full hookups, including Wi-Fi. If you are heading towards Marquette, Gitchee Gumme Campground on Highway 28 had high praise from one Circle Tour traveler who wrote us about her experiences. Within Pictured Rocks National Park there are several camping options ranging from rustic wilderness-back country to semi-modern drive-in campgrounds (but no RV facilities). Here's an Adobe PDF file from the National Park Service showing hiking trails and campgrounds. Just a few miles east of Munising is the Pictured Rocks Golf Club, a well maintained 18 hole course with wooded and open fairways. See our Pictured Rocks golf course review.